One pixel in two colors. One button. Infinite fish. This worked really well. Wasn't too hard to figure out and managed to make sense and be a little challenging even with just one input button. I like the idea! Pretty cool. I feel like I had a hard time knowing what phase I was in. Maybe more distinct blink patters would have helped? After some initial confusion (the detailed instructions were very much appreciated!) I got the hang of it and managed to catch a fish on my second and third attempt! 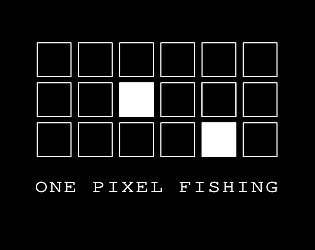 I really like the multi-stage process involved in catching a fish, and I'm impressed that a game that only uses one bit of input and one bit of output can be this fun! Great theme implementation. Sometimes a little difficulty to know in with phase the game is. I enjoy gaming your game. Perfectly meets the rules and it's playable. Had some trouble understanding the current state of the game, but in the end it was part of the fun. I think applying the fishing concept to this jam is a great idea. Nice work. I caught a fish! Once I read over the instructions a bit (the brief and lengthy versions were helpful) I understood how it worked generally- fun game!